One member of the Proteacae family that is finding a strong following in Australia is Serruria florida (see picture right). 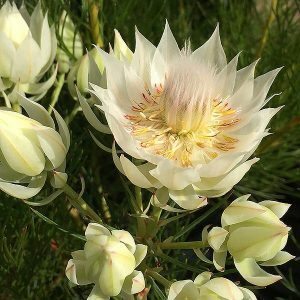 Originally from South Africa this pretty plant is fast making a name for itself around the world. Used both as a garden plant and in floristry this is also a plant that can be grown in containers on a patio or balcony if required..
One of the prettiest spring flowering plants around the cultivars now available make excellent ornamental plants and are well suited to growing in pots and containers as they are easily kept to around 1m in height. The species tends towards a white flowing form while Serruria florida rosea is more of a pink flowering form known as ‘Pretty n Pink’. 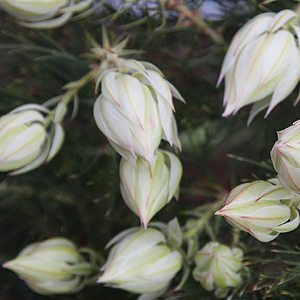 Both varieties have fine feathery foliage which is attractive through the year, it is however the spectacular display of flowers that are the main attraction. Like most members of the family, Serruria florida requires a sunny position and a well drained soil. Best grown in a native plant type potting mix. As slow release type fertiliser applied at 1/3 the recommend rate should be adequate. Protect from heavy frosts is essential. After flowering these wonderful plants can be tip pruned to maintain a bushy compact habit and promote flowering. Growing in containers is common. Prune Serrurias simply by picking the flowers, aways leaving 5 to 10 cm of foliage on each stem. Or prune back to 5 – 10 cm of foliage immediately after flowering. From seed that need to stratified by heat to germinate. Also possible from cuttings. Common Names – Serruria, Blushing Bride. Spread To around 1 metres. Flowers – White papery bracts flushed with pink, depending on variety.